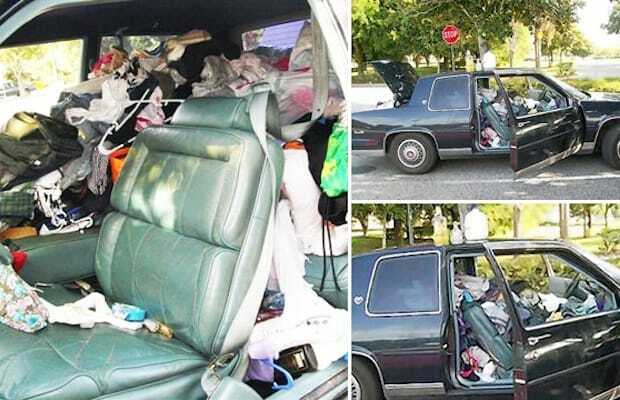 A family of five was found living in the trash-stuffed 1987 Cadillac Deville (pictured above), which was parked in a Florida Wal-Mart for several days. The parents, 31-year-old Hamilton and 26-year-old Kristin Harris were arrested for child neglect after allowing their three children to live in the car alongside chicken bones, sour milk, and other assorted garbage. The youngest child was only 1 years old. Illegal perscription drugs and a bottle of Patrón were also found in the car, removing any last hope police had that the Harrises were fit to be parents. We hope the Harris family cleans up their act (and their car) so that they can reunite with their children.